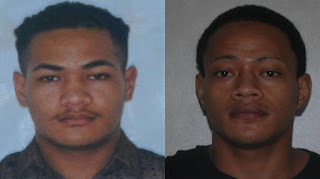 The police in Tonga are looking for two prisoners who escaped custody on Tuesday before allegedly robbing a shop owner at gun point. RNZ reports Viliami Kupu and Amoni Fifita are aged in their twenties and are described as armed and dangerous. The police said the two men escaped from the central police station in Nuku'alofa at about 5.30am on Tuesday. They said the pair is then alleged to have robbed a shop owner at gun point in Kolovai at 3pm on Tuesday afternoon. Deputy Commissioner Pelenatita Fe'ao Vaisuai appealed to the public for sightings of the men but warned they should not be approached. "The two escaped prisoners are armed and dangerous. Do not approach them," he said. Kupu was last seen wearing a black t-shirt with black shorts while Fifita was wearing a white sleeveless t-shirt, green shorts and a blue cap. Mr Vaisuai says Kupu was in custody charged with grievous bodily harm, while Fifita was charged with robbery and theft. He said anyone helping Kupu and Fifita to evade arrest would also become the subject of police attention. The police's Tactical Response Group had been deployed.